Oh my goodness, are these good! I've made pumpkin chocolate chip cookies before, but this may be my new favorite recipe for this fall goodie. 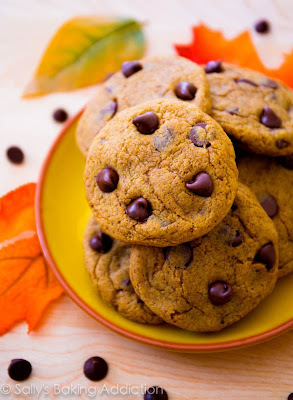 They are soft and chewy but not cakey like pumpkin chocolate chip cookies often are. A perfect fall treat. I also made another batch (a double one!) 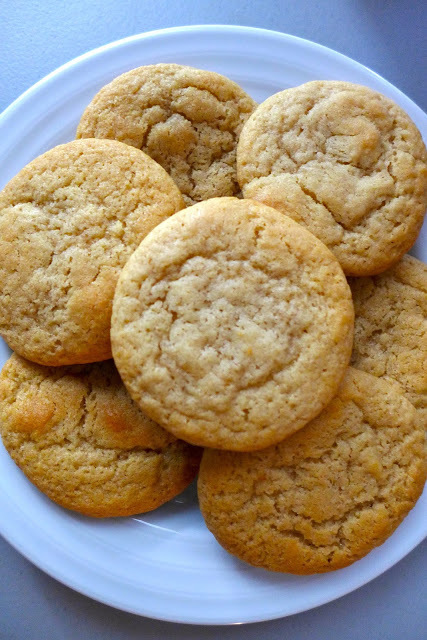 of Sugardoodles (original recipe from Averie Cooks). Once again, they were a huuuge hit! And I've also been on a no-bake kick! Within the past few weeks, I've made the following three no-bake recipes. Guess what? 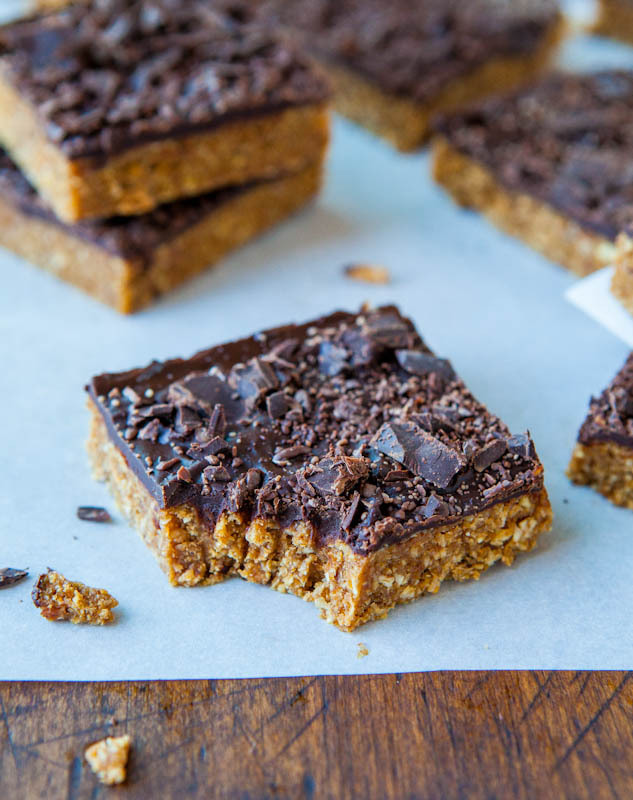 These bars are healthy! There's no added sugar. The ingredients for the base are simply oats, dates, peanut butter, agave nectar (or honey), vanilla extract, and cinnamon. And then the topping is just chocolate and milk (melted together). A no-guilt goodie! Love it. I have plans to make these again very soon. I've actually made these awesome little energy bites twice now but still haven't blogged about them. 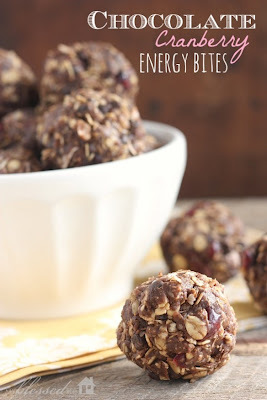 Whether they get their own blog post or not, it's about time I shared with you that these chocolate cranberry energy bites from My Blessed Life are awesome. A great sweet treat that again, is on the healthier side! What's not to love? I posted this recipe on my blog last year, and the original is from Taste and Tell. These could not be any easier! The ingredients aren't quite as healthy as the previous two treats (there's a whole stick of butter in these guys :)), but they are soooo delicious! 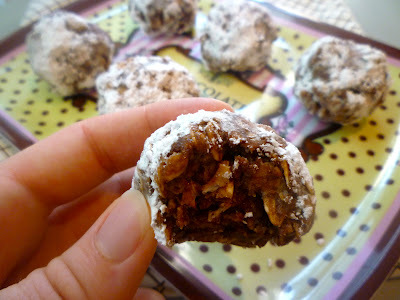 The next time you're in a pinch and need to make something quickly, remember these chocolate oatmeal cookie balls. You'll be glad you did.